Ahead of our trip, Jennifer Mannik, Executive Director of Medcan Naweza, prepared a detailed itinerary and schedule with our days organized down to the minute. We had to maximize our time here! What I've learned in my first few days is this: get your sleep and manage the jet lag as soon as possible because once at the base at the Lewa Conservancy/Lewa Downs Clinic, the pace builds and doesn't really stop. Add to that: remember to take your medicine, enjoy the freshness of cold showers because you can't quite figure out the shower knobs, and all the new sounds and buzzes that are animals/not your cell phone. 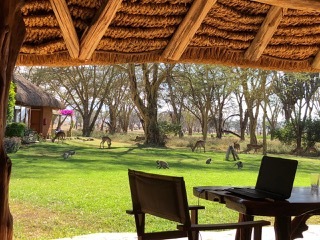 Open-air workspace: office, dining table and our monkey and impala neighbours graze nearby. Over breakfast we had to be on guard for the local monkeys who see food on the table as an invitation to eat. As Grace, one of the workers at Nigiri House said, “monkeys get hungry too.” Can’t argue with that. And so after a delicious breakfast I worked on my monkey-go-away noises. 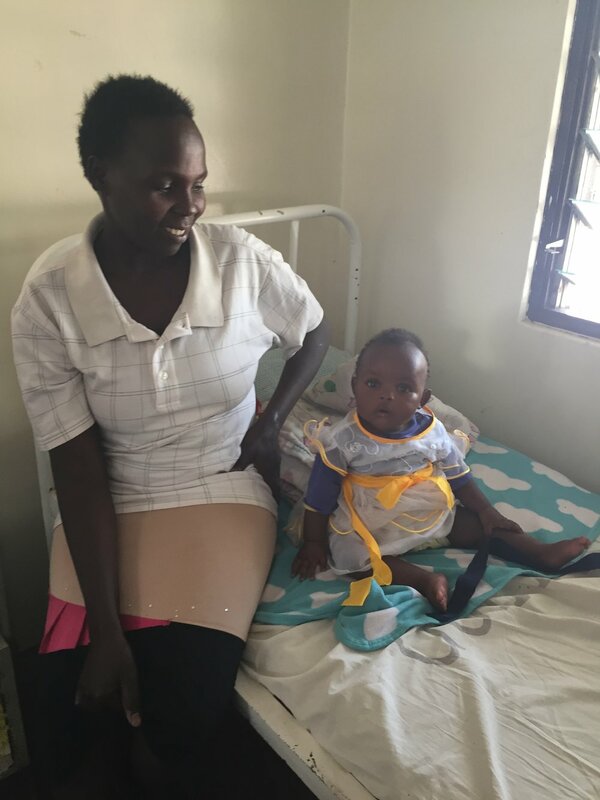 Soon thereafter Ben arrived with a car for the scheduled trip to Isiolo Hospital – the county hospital where many of Medcan Naweza's patients are referred to for follow-up care. The hospital is 23 kilometres from Ngiri House. Google Maps says it should take around 21 minutes by car. That prediction did not take into account the careful driving required to navigate motorcyclists swerving on the dirt road and making stops at the roadside, corrugated metal-roofed homes ... or the traffic jam around Isiolo’s city centre where locals were shopping for fruits and vegetables. As we waited in our van behind other idling cars, we could hear men preaching through a megaphone near a mosque while women shopped for goods wearing hijabs, niqabs, and bright Kenyan patterns. A man on a motorcycle zoomed by flashing his black and white patterned scarf. This congested and lively urban scene was a direct contrast to the calmness and green-brown vegetation where we are based; and fair depiction of the day-to-day life of the people we strive to serve. What are the social determinants of health affecting the clients we see at Lewa? ... like how do the patients who we see at Lewa Downs arrive at Isiolo Hospital when they need urgent or specialized care? Many of them travel to the Lewa clinic by foot and/or Lewa's shuttle for hours because they don't have regular access to a vehicle. How would they negotiate the additional 25 kilometres when they need urgent or specialized care? This led to a discussion about what determines health in this part of the world. Food environment: can people access the food that will boost immunity or give them strength? Housing: is the design of the patient's home safe and sanitary? Or does it promote injuries and transmission of infectious diseases? Organization of healthcare services: is it easy or difficult to access emergency care? How long must people wait to be seen at clinics they spent hours travelling to? We entered after a brief security review by the armed guards and were introduced to our host Dr. Steven Kiluva, Medical Superintentent, who told us more about his facility. Drs. Aw, Hawkes and Wong were all very impressed by the size of the facility (Dr. Kiluva said it was 23.52 HA, hectares, but that seems a little too big so I must have misunderstood) and breadth of services offered. Isiolo Hospital is a typical, full-service hospital with around 40 doctors, including a surgeon, paediatrician and OB/GYN specialist. Fourteen doctors are currently practising to become specialists. The hospital also hired four pharmacists and two dentists. It has two operating rooms; 150 inpatient beds and an ultrasound machine (but no radiologist). The most common conditions seen include HIV, respiratory conditions and malaria. While HIV awareness about prevention has spread throughout the region, adherence to medications remains to be a challenge. The high rate of respiratory conditions in regions like this is linked to poor ventilation in homes where families often live and sleep in cramped quarters near smoke-emitting cooking appliances or open fires. Deputy Matron Magdalene took us on a tour of the post-natal and maternity wards, where the doctors were briefed on complex cases including two planned caesarean sections later that day. During the maternity tour, Dr. Sue asked to see the fetoscope, the tool used to hear the in-utero heartbeat (in Canada we use an ultrasound). A common consequence when using this tool, we were told, is that the existence of a twin is often only discovered during the birthing process. Mother Charity Kajuju and daughter Blessing at 7 months in the post-natal room at Isiolo Hospital. With her permission we took this photo and share her story. Dr. Michael pointed out a mother-daughter success story in the corner of one of the maternity rooms: Mother Charity Kajuju and daughter Blessing at 7 months in the post-natal room. With Charity's permission we took this photo and share her story. Charity is HIV+ and was HIV+ while pregnant. Her daughter is thriving today (as seen with her chubby legs and curious stares), because of her mother’s adherence to medical guidelines during and after the pregnancy. While her child was exposed to HIV, she was not at this time (and will likely not be) infected with HIV. Dr. Hawkes explained that Charity likely took all the proper precautions when she learned she was pregnant – taking medication during the pregnancy, breastfeeding (HIV+ mothers in Kenya are encouraged to breastfeed rather than expose the child to the risk of unclean water-->diarrhea if baby formula was to be used) and then weaning the child off breastmilk after three months. Dr. Hawkes says the balance of risk in Kenya favours breastfeeding. We met Blessing when she was in the hospital for a check-up on the presence of HIV antibodies that were passed from her mother (and which protect Blessing from contracting HIV). There will be another test at 18 months and then Blessing will officially be considered HIV exposed but uninfected. Here are a few photos of the communication signs and health promotion efforts I saw in this hospital. Look carefully at the murals and consider what the messages were intended to be - Benard our research and ethics advisor had some helpful insights. Health promotion also comes in clothing: the woman in a yellow vest is Paula, a community health worker who wanted me to photograph the message on her back, which encourages vaccinations. The woman wearing the green shirt, Becky, told me “breast is best” and that’s why she wears this shirt that reads “breastfeeding a key to sustainable development". The last stop of the tour was for docs only: Drs. Hawkes, Aw and Wong saw the operating room and theatre, and connected with other doctors and staff available. After that we rushed back to our car in order to make it back to our group and then Lewa Downs. On our way back to Ngiri House, Dr. Wong and I spoke about the busy and bustling streets of Isiolo and how there are similarities to other highly populated places around the world. It was hard not to compare the conditions and resources we saw in that hospital to the hospitals and resources we have back at home. But comparisons are not always helpful, and in this case my greatest takeaway was the dedication to care by the community health workers, the commitment to excellence by the nurses and the diligence of the doctors and staff we met to continually work to keep their commitment to heal with care and do no harm. Also to note was the importance of family: every woman in the post-natal room I toured, had either a sister, husband or friend helping them feed, hold or soothe the newborn as they healed. A universal sign of love and support at the time of a new life.